How do we make schools more relevant to students? Teach them the skills they need in the real world, with tools they use every day. That's exactly what Esther Wojcicki, a teacher of English and journalism at Palo Alto High School, is attempting to do with the recent launch of the website 21STCenturyLit. I interviewed Esther about the site, and how she hopes it will serve as a useful tool for both students and educators. - How do you describe the mission for 21STcenturylit? The mission of 21STcenturylit.org is three fold: it is to teach students how to be intelligent consumers of digital media, to teach students how to be skillful creators of digital media, and to teach students how to search intelligently. We are living in an age when digital media and new digital tools are revolutionizing the world. Schools need to help student learn these skills, not block and censor the Internet. - Why is this important right now? We need to make school more relevant to the world we live in to combat the huge dropout problem we face. We also need to train kids to have the skills needed in the digital world. They need to know how to communicate using multiple media; they need to know how to read and write for the web; they need to know how to use social media for things other than checking on their friends. Schools should be teaching this; businesses want to hire kids with these skills. More than 40 percent of high school students nationwide drop out of school. While there are many reasons why kids drop out including economic factors, lack of reading skills, one of the main reasons cited is that they find school irrelevant, boring, and punitive. We as a nation also have a critical need for trained IT workers that is not being met by our educational system. If students learn to use digital media in school and go on to computer science courses, it will provide good jobs for them and fill an important need for our country. Right now we are getting IT workers from other countries and kids are not getting the training they need in schools. How do you think the work of a journalist mirrors that of a media consumer (newspaper reader, web user, etc.)? The skills of a journalist mirror those of today’s media consumer which is why news literacy is a critical skill for all students. 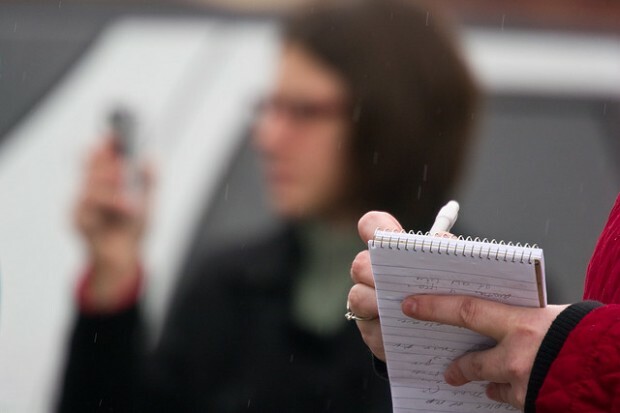 Like journalists, students today are gathering information; however, unlike journalists they do not have the skills for analyzing it, or writing about it. They should be taught these skills in school; we need to teach kids how to critically examine their research and make intelligent decisions about it. We need to teach them how to write for the web so they can feed empowered to participate. Many kids are connected to their Facebook account and their phone, but they do not comment on blogs or even write blogs. How is this being received by the education community? How are you getting the word out, and how many educators so far have come upon this site? Most teachers are interested in teaching these skills; however, many don’t feel that they have the necessary skills themselves. Teachers need time to learn these skills through professional development. They need time to learn how they can modify their teaching to incorporate the teaching of digital skills. For example, English teachers need to teach students how to collaborate online with their writing projects. Just using the web to collaborate helps student understand what is happening in businesses. Instead of writing a paper, printing it out and turning it in, kids can turn the paper in online and peer-edit their work online before turning it in. One of the most widely used collaboration tools is Google Docs, a free online word processing program. In using this method, students learn more than just how to write a paper; they learn how to use digital tools. Students should also learn to blog. At the moment, many schools block blogging because they are worried kids will access ‘inappropriate’ blogs. How is this teaching kids about the real world? We need to make school more relevant to the world we live in to combat the huge dropout problem we face. We also need to train kids to have the skills needed in the digital world. Students can be asked, for example, to do research on health care in America and compare it to health care in other parts of the world. Just doing the research is exciting for students but most of them do not know how to analyze their results. They need to be taught. For example, who created the website, what are their political objectives, how objective is the information. Administrators need to help teachers who in turn help students learn how to analyze their result, not block the web. In too many schools today, the web is blocked!! Yes, blocked. Schools use special censoring services that ensure that kids will never find anything ‘objectionable.’ How is this teaching about the real world when they are never allowed to access the real world, except at home. Schools are making themselves irrelevant by failing to teach kids about the world we live in. - What's your hope with this site? I'm hoping that this site will provide teachers several lesson plans that will help them teach students a) how to search effectively b) how to analyze their search results c) how to differentiate between fact and opinion d) how to write for the web. I have lesson plans to teach how to write a personality feature, how to write a news story, how to write reviews of movies, games, books, websites. There are also lesson plans of how to understand copyright and how to use Creative Commons licenses to modify copyright so students can learn to share and remix legally. How are educators accessing these kinds of excellent resources online? Do you believe there's a good system in place to let them know, or do you think it's still quite fragmented and decentralized? The system is still quite fragmented and decentralized. There are many sites and many entrepreneurs trying to create materials for teachers but one of the main problems is finding these resources. If the user doesn’t know the key words, then they won’t find them. What solution do you think might work for creating a central repository of sorts? I am working with a group of universities who are looking at ways to optimize the finding of Open Educational Resources. Hopefully, this will happen in 2011 but until then teachers need to know the address of the site or the key words to find the materials.